Eight religious leaders supported the establishment of IIPI by signing the IIPI Declaration. The religions included: Hinduism, Buddhism, Christianity, Islam, the Baha’i Faith, Jainism, Judaism and Sikhism. The Chief Guest was Dr. Jitendra Singh, the Honorable Minister of State for the Prime Minister’s Office (below: 2nd photo, center with green shirt). Over 200 attended the event at the prestigious Indian Habitat Centre. Interfaith harmony is not an option for India. If left unchecked religious and communal violence can spread like a wild fire and easily escalate out of control. In fact, the very survival of India as a nation depends on religious concord. 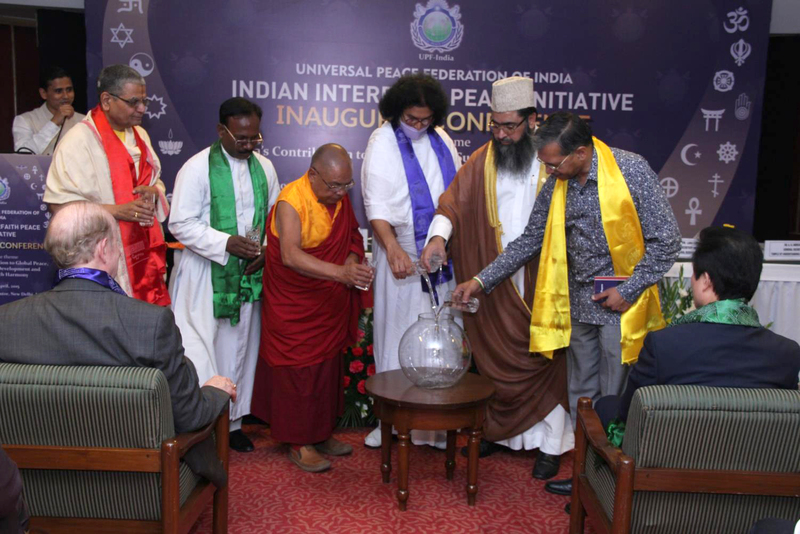 The following day in New Delhi the Universal Peace Federation of India launched a much-needed interreligious council called the Indian Interfaith Peace Initiative. At the end of this conference the Youth Federation for World Peace-India (YFWP) was officially inaugurated. On behalf of our True Parents, Dr. and Mrs. Sun Myung Moon, thank you for inviting me here today. Before coming to India I personally met Mother Moon and she especially asked me to give to you her warm and sincere greetings. She so much appreciates your hard work and sincere investment to help India become a model for global peace, sustainable development and interfaith harmony. More than ever, these ideals are desperately needed in our world today. We are here to inaugurate the “Indian Interfaith Peace Initiative” or IIPI. Please allow me to share some insights about this important initiative. Father and Mother Moon worked their entire lives to create understanding and cooperation between the religions of the world. In fact, this vision was so important that Father Moon called for an interfaith council at the United Nations itself. This proposal was first made by Father Moon at the UN headquarters in New York City in 2001. Now people are beginning to see the importance of this vision. If such an interreligious council had been established 14 years ago, then it would have gone a long way to help prevent some of the most radical forms of extremism today. Father Moon teaches that religions should instruct their followers to sacrifice themselves for others; not to sacrifice others for themselves. “Living for the sake of others,” is the motto that has guided every program and project of our True Parents, including establishing UPF. I am happy to know that one of the objectives of the IIPI is to support an interfaith council in India. In 2001, after 9.11 when the World Trade Centers in New York were destroyed, Father Moon had another idea. Sadly, it too went unheeded. He said that all the religions in the world should donate to rebuild the twin towers. New York is, of course, already the headquarters of the United Nations. But how wonderful it would have been if there were a monument in the same city as the UN — at the heart of the financial district — which stood tall as a substantial symbol of religious harmony? At that time, people thought it was a crazy idea. They thought that it would cost too much money. But how much could have been saved if religions actually worked together for the betterment of humankind, instead of fighting and competing with each other? This saving would not only be economical in nature, more importantly, it would save so much human suffering and grief. We did not want to pay then, so we are paying now. But let’s learn from our mistakes and move forward. India has a long and rich history of saints and sages who have worked tirelessly, even giving up their lives, to bring harmony among religions and universal peace to the world. India is also home to the largest Hindu population in the world as well as the second largest Muslim population. As a culture, India has given birth to Buddhism, Jainism, Sikhism and welcomed Christians, Zoroastrians, Jews and others to their land. Religious harmony is not only in your history… it is in your blood — in your DNA. We need to tap into this rich spiritual legacy and connect it to the IIPI. How can this be done? Already there is a proposal to establish a UPF Chair at the Indira Gandhi National Open University. This must be supported and put on a fast-track. Global peace cannot be built on the expectation that everyone in the world adopt one single religion. That will not happen. This is why people often ask, “Then what is Rev. Moon’s religion?” Father and Mother Moon’s religion is the family. This is because the family is the cornerstone and framework for world peace. This is where our universal and eternal values are created. All religions honor marriage and family. When these family values and relationships are brought into our societies, nations and world, then peace is assured. When we treat each other as members of our own family, world peace can be realized. I would like to close by thanking the UPF-India chapter for hosting this important event. 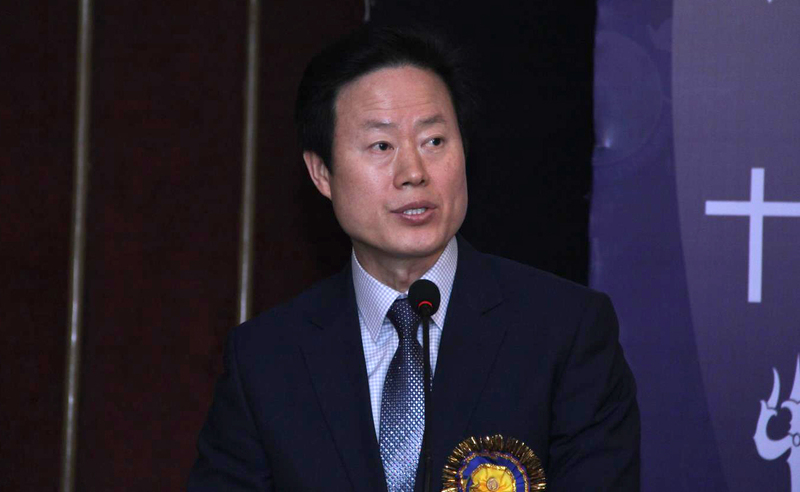 Upon returning to Korea, I will report to Mother Moon that the Indian Interfaith Peace Initiative is very much in line with Father Moon’s legacy. May God bless you, your families and the great nation of India.